A group of 15 AIA visitors joined me (lecturer Mary MacLeod Rivett) and several local staff for a 10-day trip to Orkney and Shetland, the northern isles of Scotland, in the second half of August 2018. This is a favourite tour with both the AIA folk and the guides, and it ran beautifully smoothly, and was enjoyed by everyone. The weather earlier in the summer in Scotland had been hot and dry, but this broke just before the start of the Northern Isles tour. Despite this, only one small part of the trip was lost to wind and rain - on the first day, a walk along cliff tops near Skara Brae in Orkney wasn’t considered advisable in gale-force winds! For the rest of the visit, though, the rain stopped as we stepped out of the vans which drove us to our starting points for each day’s walk, and often resumed as soon as we got back in them at the end of the day. This made the hotels feel cosier and even more welcoming and justified the consumption of warming drams of the local whiskies. In Orkney, visiting the ongoing excavations at the Ness of Brodgar, with a private tour from director Nick Card, was wonderful. The excavations just get more interesting each year, and are undoubtedly rewriting our understanding of the Neolithic period, not just in the north of Scotland, but across the whole of Europe. It was hard to drag people away from the site. 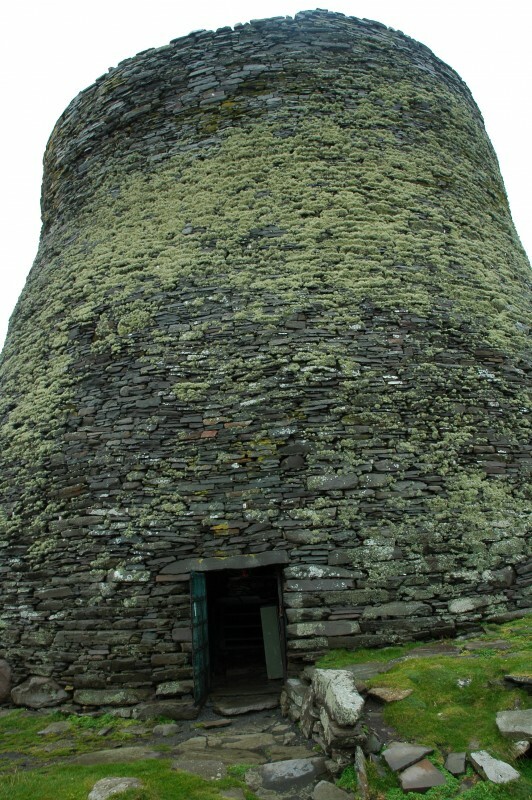 Up in Shetland, a high point was undoubtedly visiting the Iron Age broch at Mousa. A beautiful crossing to the uninhabited, off-shore island, which is a bird sanctuary, and a gentle walk around the island looking at the seals, birds, and archaeological remains, culminated in a visit to this (see photo) intact, 2000-year-old, drystone tower. Those who wanted to, climbed to the top of the 13m high wall, to look out over the island and across the sound to the much-less well-preserved remains of another broch opposite, on the mainland of Shetland. On our final day in Shetland, we also had the pleasure of congratulating two of our group on their imminent 50th wedding anniversary, with glasses of champagne. We came back to Aberdeen overnight on the luxurious ferry, and departed reluctantly for home on the 26th, many of us hoping to return. The AIA is offering this northern Scotland hiking tour again in July 2019, this time with AIA lecturer/host Val Turner (and still a maximum of 15 travelers), and is taking reservations now. Click here for more information!